On May 4, 2012, the UMD Symphony Orchestra (UMSO) performed Debussy's "Prelude to the Afternoon of a Faun" from memory, with movement design by choreographer Liz Lerman. Movement is an inherent element of music-making; yet, its impact goes largely unexplored in the orchestral setting. UMSO's performance of "Prelude to the Afternoon of the Faun" explores the connection between movement and music, specifically, how that connection facilitates communication and a colorful, nuanced performance. I just can't imagine why we don't do this more often! How fabulously this would go over in any setting from an unforgettable educational concert for youngsters, to an orchestra's creativity throughout its season. Rodion Shchedrin's "The Sealed Angel". A monumental work for chorus and solo flute. 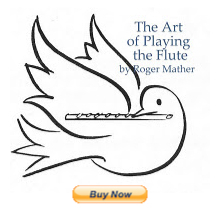 The fifth movement is for flute alone. I just love to see flutists move across an acoustic space. Thanks for sharing this Jen, this is very timely! I was teaching a student just this morning, and trying to get across that as a wind player, breathing is part of playing and so is part of how we interpret music. She tends not to breathe, and so ends up almost expiring at the end of long phrases simply because she feels pressure to play without interruption like a string player or pianist. I'll be showing her this video - music IS a physical thing and our living, breathing, moving bodies are how we make music! I'm so glad to help. Thanks for sharing the exhale-til-you-pale phenomena. I know it well. Talk about moving the marching band concept towards a dancing orchestra!! Why not? I'm a choral conductor who played flute back in elementary school and have just picked it up again, so I've been reading your wonderful blog. What a treat to see this link: I finished my doctorate in choral conducting at UMD in 2008, and performed many a concert on that very stage. James Ross was my instrumental conducting professor during that time, and he's phenomenal. Thank you so much for sharing this!